The struggle for liberation has never been about safety; justice is gained by confronting reality, however dangerous it may be. 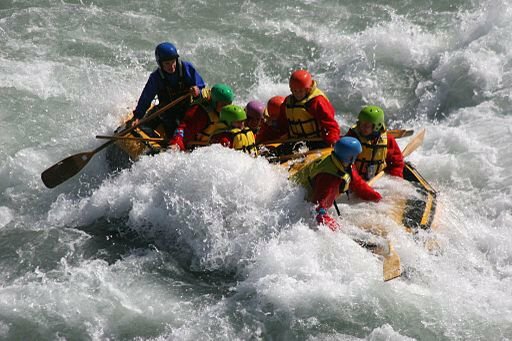 White water rafting, Rangitata Valley, NZ. Credit: Flickr/Rob Chandler via Wikimedia Commons. CC BY 2.0. The latest lurch in global statecraft—Trump’s dissing NATO allies then playing footsie with Vladimir Putin—leaves many scrambling to maintain some balance. Republicans for whom the enemy status of Russia is an article of faith are beside themselves. Democrats are running out of adjectives to describe Trump’s behavior. And activists who have been around for longer than the last election are wondering how to steer a steady course in the midst of extremities. Deming’s personal experience in the 1960s civil rights movement brought that kind of challenge, she said in her reflection “On Revolution and Equilibrium.” Deming found in the midst of turbulence that her commitment to nonviolence was steadying for her and others. Locked up in jail in Albany, Georgia, as one of a group of pacifists arrested for breaking the segregation laws, Deming undertook a fast that—when I saw her in the courtroom—left her hardly able to walk. The group won their struggle with the infamous Sheriff Laurie Pritchett. When I read her essay, I saw that her nonviolent commitment had a steadying ability to lead her more deeply into her center—where, as organizer and trainer Starhawk teaches, one source of power lies. Community organizers know this, nurturing leadership skills and supporting group solidarity—so that when the white water comes, the team will paddle together. But what do we do now that we’ve already entered the white water? As a gay man brought up working class, I am in touch with the fear that leads me to judging, to differentiating myself from people who I expect through long experience will keep the micro-aggressions coming. These days I rage and cry, at home, about the professional middle-class activists whose description of Trump supporters is riddled with prejudice against my class. Support growing interest in alternatives.